Like so many winter days gone by, last Friday was spent on a tractor, re-arranging piles of snowflakes, as was a good part of Saturday. That’s the excuse we’re using for the failure to post Flashback Friday: Valentine’s Edition, but just between us, there never was such a post to begin with. 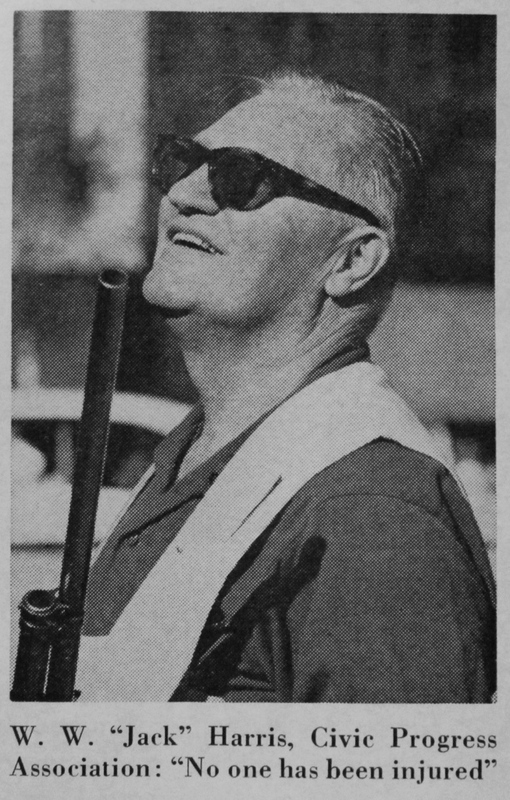 Stay tuned for upcoming words about winter (spoiler alert: we’re a little tired of it) but, in the meantime, here’s a little something about a time when heavily- armed men roamed the streets of Indianapolis and the sounds of shotguns meant things were looking up. Two men (behind hydrant and partially obscured behind lamp post) discharging shotguns in downtown Indianapolis. According to a story by Clare Conley in the December, 1963, issue of Field & Stream magazine, the gunmen in the photo are actually civic-minded folks, members of the Junior Chamber of Commerce, stepping in to save their town from an infestation even worse than zombies. Shooters Solve the Pigeon Problem! 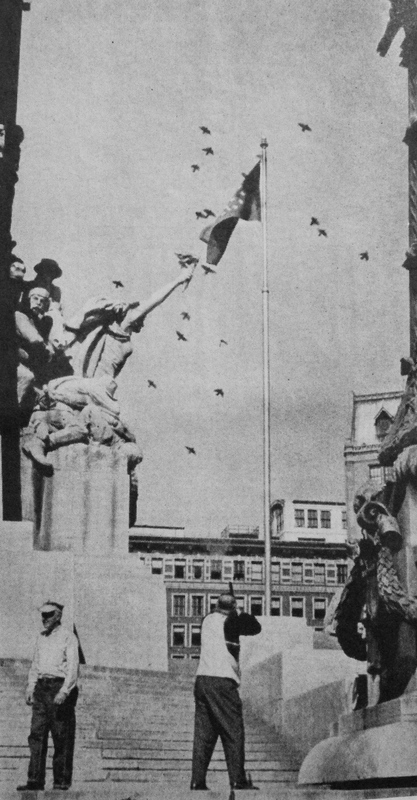 Judging from the spiffy, modern streetlamps, along with all the signs and ledges in the first photo, Indianapolis was a perch and roost-rich environment in 1963 but the pigeon problem had persisted since long before that. Pigeons had thrived and multiplied and pooped, as pigeons do, and by 1958 the city was not only unsightly, it was becoming a health hazard as well. Trapping, poisoning and pigeon-proofing had not solved the problem but someone heard about a shooting program to eradicate starlings in Cincinnati and a delegation was dispatched to learn more. It turned out that the starlings of Cincinnati were blasted out of trees by the thousands, at night while at roost, and their numbers had become much more manageable, but pigeons don’t gather coveniently in trees at night. If the good folks of Indianapolis were going to shoot their way out of their downtown pigeon problem they were going to have to do it in broad daylight. With backing from the Civic Progress Association and the Junior Chamber of Commerce, a plan for day-time pigeon shooting was approved by the city council and two dozen Pigeon-Eradicator Licences were issued. At first, everyone with a license participated in the shooting, all at once, but they soon found it easier to move from place to place in small groups, four to a car, with a uniformed policeman along to keep spectators out of the way. Hunts were held every other Sunday from 1 to 5 p.m. with ammunition bought using money donated by the downtown businesses. With shotguns covering the skies, scoped rifles firing .22 shorts were used to pick off sitting pigeons that were out of shotgun range but only with a solid stop, such as masonry, behind the bird. Damage to buildings was reported to be minimal, just two or three small windows broken by falling pigeons. It was said the pigeons simply bounced off plate-glass storefronts. How does one get “Jack” from “W.W.”? A city sanitation truck and crew were on hand to immediately pick up all dead birds and quickly dispatch ones that were only winged. This, according to Dr. David M. Silver, president of the Board of Public Safety, was an important part of the project’s public relations, keeping the streets clean and avoiding criticism about letting birds suffer. We at The View from Fish in a Barrel Pond commend Dr. Silver and the others for not leaving dead and injured birds lying about. 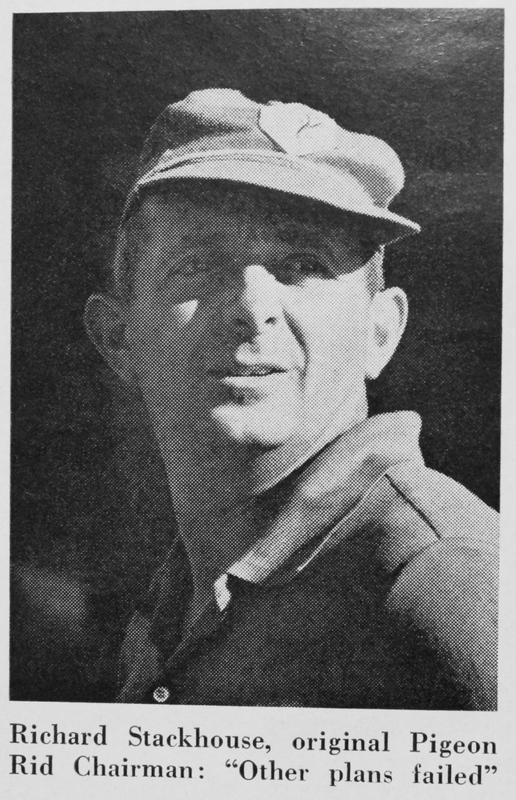 The original caption for the above photo read, in part, “City Sanitation worker (left) waits for birds to fall”. We notice he is also turned away from potentially bouncing pellets. No word on the flag. With an endorsement like that from Mr. Conley, we are surprised the city council missed the recreational opportunity for urban dwellers and the revenue generating potential of Pigeon-Eradicator Licenses. At the very least, the Jaycees let slip some valuable fund-raisers by not augmenting those tired old pancake breakfast raffles with the chance for a little driving around town in cars, shooting birds. 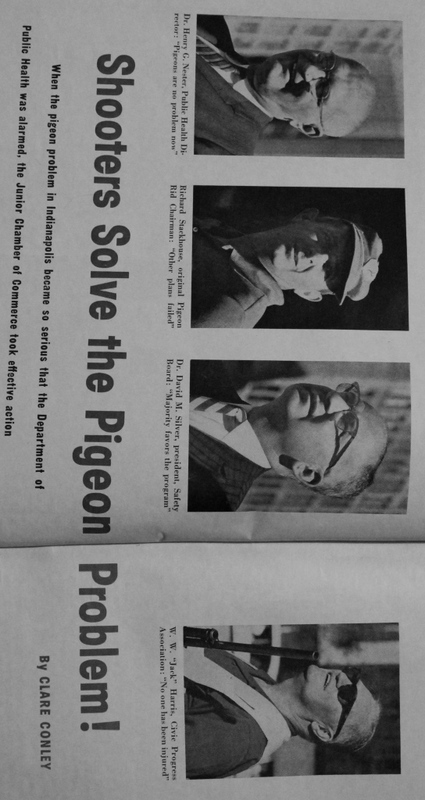 The Indianapolis Junior Chamber of Commerce continued the Pigeon Rid Project until at least 1965, but we’ve found nothing to indicate how long it went on. People still struggle with over-populations of animals, be they pigeons, starlings, rats or even deer. Bow hunters in the suburbs are not unusual these days, and we’ve heard tales of Tuesday morning deer hunts on golf courses, but men with shotguns on downtown street corners might be considered a bit extreme in this day and age, not to mention a tad unnerving but, good, bad, or otherwise, here’s to the gun-toting community pillars of Indianapolis who cleaned up their city and showed that groups of men with shotguns, riding around in cars and shooting from street corners can be a perfectly normal part of urban life in America. Thanks for the Flashback, Quill! Good story. Don’t suppose you would see that if you ventured to Indianapolis these days. I don’t think many people in Indianapolis — or anywhere else, for that matter — would think it’s a good idea these days, and not just because of the guns. I remember when peregrine falcons were introduced in Denver and started preying on pigeons. That freaked a lot of people out. Oh for the days of shooting in town and watching as unsuspecting citizens expressed surprise! When I was in New Hampshire, one guy I worked with called pigeons “barn partridges” because they could be a real challenge in close quarters. In Texas, they were so numerous where I worked that we had a guy come in and set up rocket nets to catch pigeons by the hundreds. When we asked what he was going to do with all those live pigeons he told us he sold them to high-end restaurants as squab.